Huautla de Jimenez in the Sierra Mazateca of Oaxaca, Mexico is the town I’ve spent a lifetime passing through but have never actually stayed in for more than a night. To the outside world, Huautla is the birthplace of the psilocybin mushroom religion, but for me Huautla has always been the last town in the Mazateca with a hotel and hot shower. A pit stop to rest and gather supplies before heading over the mountain and down to my long-time hideaway in the tropical cloud forest on the other side of the mountain. Heather and I arrive in Huautla on an unseasonably dry July night in the middle of the rainy season. Our first stop: my favorite old haunt the rustic Hotel Julieta, where we settle into our room overlooking the town of Huatla. I am glad to be back in the Mazateca, but the clear night sky unnerves me. Without the rain, the chances of Desheto showing himself are next to none and he is who we are looking for. All night, I toss and turn in bed, kept awake by the lack of rain and the kind of self-doubt that only comes out in the dark. When I finally do drift off into restless dreams, it is only to be awakened before dawn by dogs fighting in the street. Mumbling obscenities at the hounds of hell who interrupted my dreams, I stumble towards the bathroom to take a shower, closing the door so I won’t wake Heather. The hot water brings me back to life and I laugh to myself how the Hotel Julieta, a boondock, eighteen-dollar a night Mazatecan run hotel, has better hot water than half the five-star hotels in Mexico City. Ah, the magic of Mexico! At first light I’m in the streets giving every scraggly pooch I see an accusing eye, still grumpy from my lack of sleep. As it begins to drizzle I take a deep breath of the early morning air, hopeful that the long-awaited rains will soon arrive. In the midst of my reverie, a senora with long gray braids seems to materialize out of the mist. 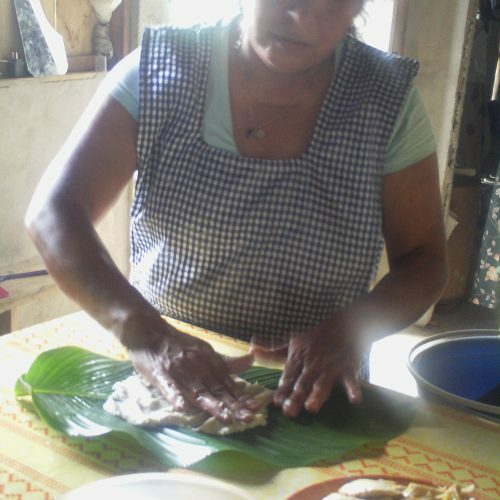 I notice that she is selling the specially blessed beeswax candles that are used for Velada ceremonies and I know from my last visit to Huautla that these candles have become very difficult to find. Seeing her there now reassures me that if I looked carefully enough, “the Old Time Religion” is still alive, though it may be hiding deep in the shadows of Mexico. Returning to the Hotel Julieta, I see Heather standing at the curb with our luggage. Striking, but not so inviting, Heather stands guard over our possessions like a grizzly koala in Patagonia travel wear, ready to shape-shift from adorable to claws of death if provoked. I pity any fool that tries to mess with our stuff. But in truth, Huautla had changed over the years, becoming safer and more tourist friendly. As I flag down a taxi for Chilchotla, the sun comes out and the possibility of the long awaited rain passes. The taxi that finally arrives is covered in cheesy magic mushroom stickers and as we travel through the streets I see kids everywhere hypnotized by cellphones as they walk to school. I began to feel like a living relic taking a taxi back in time, a time that seems to be receding as quickly as the road I watch disappear behind us in the rearview mirror. Luckily Gordo, a local I know, is already waiting with his half demolished pickup truck in the plaza and he drives us to the edge of town where the road used to end. Now the “end of the road” extends far beyond the town, and cuts through the Cloud Forest like a sacrificial knife piercing the heart of the mountain. Off in the distance we can see Giant Caterpillar tractors carving out even more roads through the virgin soil where the Little Ones, the fruit of the Ghost Dance, once grew. Following close behind the tractors are trucks with cranes hard at work planting electrical poles in the ground. 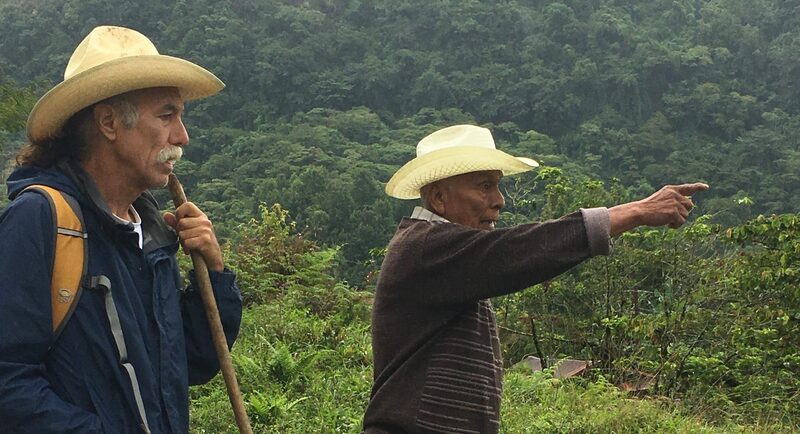 When I first arrived in Huautla, almost fifty-years ago, the Little Ones could be found in the nearby cloud forest, but when electricity arrived, they disappeared. As the electricity gained momentum, the Little Ones abandoned the mountain of the god Chicon Tocosho and retreated to our current destination, the remote cloud forest of Chico Nindo, on the other side of the mountain. It was from Chico Nindo’s seed that the Little Ones were born during the first Ghost Dance. With the trees cut down and the lights turned on, there were no more shadows left for the sacred mushrooms to hide under. I wondered if I’d returned too late and Desheto and the Little Ones had already gone, fading into the darkness as they faced the bright glare of an incandescent bulb. But before I can sink into a complete state of doom and gloom, a spark of the old flame flickers as we arrive at Daniel and Lucia’s door. As our old friends come outside to greet us, I am delighted to see that Daniel has made an almost complete recovery from his fall off the side of a cliff several years ago, an improvement from the last time we were here. Lucia hugs me and then squeezes “Binky” with joy. Gathering together our bags and all the food we have bought in Chilchotla, we happily make our way into Lucia’s kitchen, which has fed me so well over the years. Lucia and I have spent many hours sitting on tiny wooden chairs and talking here while sipping coffee as it rains outside; her kitchen has always been my shelter from the storm. Now, although at first things seemed to have not changed at all, I find out soon enough that appearances can be deceiving. 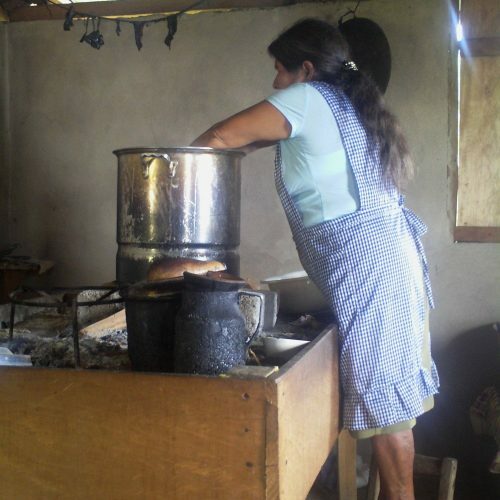 Lucia’s kitchen is still a near perfect time capsule of an ancient Mexican kitchen with matates, comals, clay pots, the wood fire smoke and a hint of chili pepper in the air. But even here I find that progress has arrived as Lucia stops to show me her new electric light and blender, which she demonstrates to us with great pride. Not to be outdone, Daniel calls me to follow him next-door to the old tienda, where they once sold soda, beans, beer, soap and other practical items. Daniel thinks for a moment and I watch as the light bulbs go on over his head. I don’t think he has put it together until that very moment, that the electricity might be connected with Desheto’s disappearance. But for the moment he lets that “coincidence” go, eager to show me his next surprise. Swinging open the door of the tienda, he excitedly ushers me inside. Talk about an alternate reality! Behind door number 3, I am shocked to see that the tienda has been transformed into a “Viva Las Vegas,” style mini bachelor pad that this side of the cloud forest has likely never seen before. “My son built it, so he can live here someday. This will be his home,” Daniel explains with pride. Then my old Indio friend Daniel sits down on the couch and flicks on a TV remote, telling me that while Lucha Libre is his favorite show, Lucia prefers the telenovelas. “You really like this fake wrestling stuff?” I ask him. But when the female wrestlers enter the ring on the flat screen Daniel looks uncomfortable. “And yet you continue to watch it?” I reply, just to bust his balls. We both laugh. “But don’t you miss the good old days?” I ask him. “I guess those times really weren’t so good.” I agree. “What about the lack of water that the locals are about to kill each other over and the smell of car fumes? I bet they don’t love that?” I poke. I grin and we both crack up laughing. Then Daniel stops abruptly. “Really, thank god you’re here, no joke, the water is drying up and it won’t rain. We’re in trouble, seriously. You know how people get when they run out of water. I just look at Daniel and because he already knows the answer, he answers himself. So, I leave the tienda on a high note and go to bed. For the past two nights I have barely slept, and when I did lay down I had a freight train running through a tunnel in the middle of my head. Tonight, Heather rubs my back, but it brings no relief. I am hanging on the travel worn edge of sleep praying for rain, and trying, despite the evidence, to believe that Desheto is still alive.